I would like to know how to remove the arbor as the chuck come off leaving the arbor in place. I assume you mean the arbor is stuck in the quill of the drill press. Most drill press quills have a slot in them and the end of the arbor is visible through the slot. A wedge is used to push the arbor out. If you don’t have one they are easily made from 1/8″ thick mild steel. Cut a piece 1″ wide X 4-1/2″ long. Measure from one end and mark a line at 1-3/4″ across the piece. Draw a line from one side of the line to the far side corner to lay out a wedge. Cut on the line and you’ll have a wedge. Deburr and stick it in the quill slot and tap the arbor out. Hope this helps. Rob has a photo of this arbor that he didn’t publish but should have on file. Rob? How does one go about finding a replacement arbor… are there standard sizes? The reason I ask is because I bought a used Central Machinery 34 Inch Floor Radial Drill Press, and I think it has a wrong arbor in it. If I put a bit in the chuck and try to drill something the whole chuck spins as soon as I put any pressure on it, and the arbor falls right out of the quill. When I measure up inside the quill it is about 1/2″ longer than the arbor, so I don’t think the fit is right. Your machine should have a No.2 Morse Taper arbor in it and the arbor that came with the machine should fit. I suppose it is possible for the factory to ship a machine with the wrong arbor but I haven’t heard of it before. Quite often, there is a burr or some contaminant that is preventing a good fit, which explains why the chuck is falling out of the spindle. I’ve seen this so many times that it is the first conclusion I jump to. I suggest wiping the arbor and quill taper with a clean rag and then lightly spinning the arbor in the quill taper to see if you can see a burr mark on either one. If you do, then clear that burr completely. If not, then it may just be grease or oil in there. Wipe both the taper and arbor with lacquer thinner or acetone, then use a scotchbrite pad and scour them lightly, then clean them again with lacquer thinner. You can then try seating them again by twisting the arbor into the taper until it seats; cover the chuck with a piece of wood and give it a good tap with a hammer. That should seat the arbor well. If you did a good job of cleaning the arbor and taper that chuck should stay in there until you take it out. As for how you find a replacement arbor, you need to know the spindle taper of your machine and the taper of the chuck. 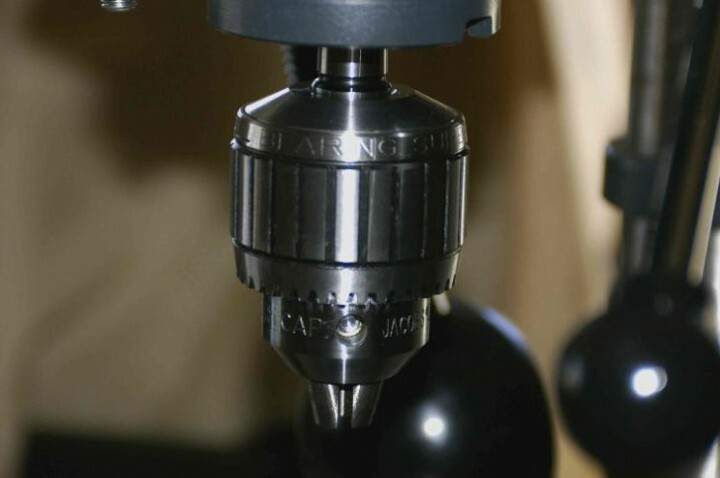 Your machine has a 2MT, while the chuck taper, usually a Jacobs taper, depends on the model chuck you have. Once you know the chucks Jacobs taper size you can buy a Jacobs, Albrecht, or some other arbor with a MT2 taper on one end and the appropriate JT on the other and it should work fine. I find Jacobs arbors to be acceptably accurate, while Albrecht arbors are amongst the finest you can buy. Both makes can be found at any industrial supply house (Enco, Travers, MSC, etc) or on eBay. I hope this helps. If not, please let me know.